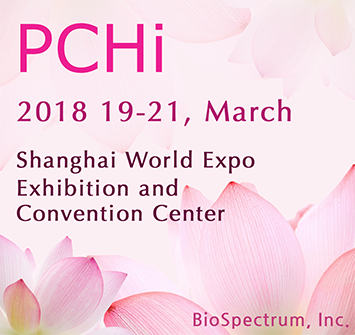 BioSpectrum will attend PCHi 2018 held in Shanghai, China from March 19th to 21st, 2018. PCHi (Personal Care and Homecare ingredients, www.pchi-china.com) is one of the biggest annual event in Chinese cosmetic industry which is held in Yangtze-Pearl River (揚子-珠江) Delta economic zone, alternately. Yangtze-Pearl River Delta Economic region is the most developed economy industrial place in China. PCHi held in the main cities (Guangzhou and Shanghai) of the region provides a promising platform to expand the business into the Chinese cosmetic market. For this year’s PCHi, BioSpectrum will run the booths with our local distributor, Ruiyu, and strategic partner company, Clariant. Including the on-going bestsellers of BioSpectrum, we will unveil our Nobel Prize-inspired new active ingredient, the circadian rhythm synchronizer. Please visit us and do not miss the chance to become a fast mover in the market.